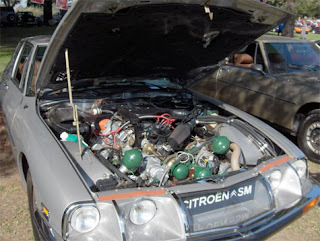 Riding home some time ago I saw a stunning Citroen SM in a car dealer/restorer lot. Had to stop, and just stare for a while, you don't see these all the time. One of those low-slung, long, wide but small, beautiful, spacepod things, gobs of power and speed in a car that was built to driven by princes and artists and diplomats. A car, along with Jaguar E-series, Mercedes 240, '66 Mustang, that I've always wanted, actually fantasized that I could someday own and drive. Not drive a lot, of course, I'd keep my Volvo for actual use, but how can I explain, you either understand or you can't, what it would be like to just pull up a chair in my garage and sit there and stare. That's mine. I got one. It's awesome. It's French, it's different. Intentionally. The French are different intentionally, I think. Before they make something, they look around, and they ask: What should work the best in this situation? What makes sense? Can we make it simple and effective? How do the English do it? The Italians? Those insolent Americans? Are there international standards? What does ISO have to say about it? JIS? What is accepted practice? What is normal? And when research is concluded, they sit down to figure out how to do something...else. Something ELSE. While the rest of the world is using 100mm dropouts, they use...99mm. Where everyone else uses a 5mm cap screw, they use a...8mm...hex head. When everyone else uses paint, they use...chrome. Where everyone else uses chrome, they use...aluminum. Bushing? No, ball bearing. External sleeve? No, internal. Aluminum derailleur? No, plastic derailleur. Plastic shift levers. Even plastic brake levers. Isn't that cool? Plastic break levers. They won't break, they'll work fine. And even though Campy, Shimano, Suntour, Sugino, British, Italian, Swiss, BMX, Octalink, ISIS, it seems EVERYONE ELSE uses a 22mm crank extractor thread, they use...23mm. Except Stronglight, who used 23.35, because of course TA was already using 23. 23.35mm. How many Stronglight cranks have been ruined for lack of a 23.35mm extractor? So many old French bikes have fallen victim to mechanics. Everybody screws up their first French bike, whether it's a Peugeot UO8 or a Singer. It doesn't matter, you have to be hyper-vigilant, as at some point you won't know whether that fastener is a right-hand or left-hand thread, or whether the nut on the other side is floating or welded on, or is there a bushing in there or bearings which will spill out all over the floor? Move slowly, don't adjust yourself into a corner and then have to re-engineer something. Ever try to mount an old Ideale saddle? Sometimes your clamp tightens, sometimes it won't because the RAILS ARE A SMALLER DIAMETER than everyone else's! You have to use a French seatpost to do it reliably, but of course French seatposts are a special size, which means that you have to use a French frame, and then only French derailleurs, BB, headset, and hub O.L.D. fit into a French frame properly, so you might as well just capitulate and get a French bicycle if you want to use an Ideale saddle. My (wonderful, sublime, French) randonneur bike has a 26.4mm seatpost, which the seat tube had to be shrunk to accept. And they didn't even do it well, I think perhaps in spite. Just to say, "see, here we thumbed this up just to annoy you, (vous poor uninlitenende anglais tripe), but we still think it will work fine." WHY DO THAT? Is it so important to use 26.4 that you have to alter a carefully-drawn tube to do it? Why not just use the 27.0mm that the tube is designed to take? Is it more convenient to swage a steel tube than it is to turn a different diameter into aluminum? If you have to use that seatpost, then why not use your own frenchy tubes duh that are already made to fit the post already duh, is that too obvious duh? Craziness! Before WWII, when French gunnery experts were trying to decide on a bore size for the primary guns on battleship Richelieu, they certainly knew that other great maritime powers were using 14-inch, 15-, 16-, 17, and even 18-inch guns (bigger is better, normally, on a battleship). And of course having this information, they had a great and doubtless heated discussion over whether to employ....13.4-inch or 13.8-inch. Have you ever had a pair of French shoes? I haven't. Italian, sure, I have four or five pairs, great shoes-they fit better the longer you have them. Chinese shoes, of course, a couple of pairs, cheap and effective, disposable, fit well new and wear out fast. English shoes, yes. American boots too, even got some Dutch clogs. But no French shoes. Why is that? Do they have special feet there? Not like Everybody Else's? But that gorgeous car, I don't care if it's different. Maybe that's part of its charm. Think of automatic shift levers in cars...where do you imagine them? Of all the cars you've driven, how does the shifter work? Up and down, right? Whether it's on the column or on the hump, it's UP and DOWN. Or maybe TO and FROM. This one works...from left...to right. Or perhaps right to left, does it matter? Perhaps buttons on the ceiling were not possible? And I don't doubt that it's not the normal P-R-N-D-2-1, either. Probably R-N-1-2-D-P. It only makes sense if you're already used to it. Open the hood, and what do you expect? Wires, hoses? Sure, lots of 'em. Maybe a nice polished cover? Black plastic cowls and a huge radiator? Ha. Green Hydropneumatic Spheres. That's right, green balls, at least four of them the size of large grapefruit. They operate as parts of the suspension, to raise and lower the car, among other things. What an interesting, great, completely arcane idea...raise and lower the car hydropneumatically. Self-levels with a load. Tiptoe through puddles, hunker down at higher speeds. Float more on cobbles. Bounce up and down at intersections. We can use it for steering too, and the headlights. Use it to adjust the windshield wipers. Maybe it can be hooked up to the radio. It won't leak. Air never leaks, neither does oil...it'll work fine. And how many headlights would you like while we're at it? One on each side? Maybe two on each side? How about six? Six headlights, three on each side, two pivoting with the steering wheel, which automatically re-centers when the car is not in motion. Also, an oval steering wheel and gauges, aluminum bonnet, stainless trim. Front wheel drive. Carbon-fiber wheels were an option, as was a set of fitted luggage. Maserati engine, Lotus transmission. The brakes are operated with a button on the floor, not a pedal as with lesser cars. Evidently the cars imported to the U.S. had four headlights, we just had to put our foot down. Picture used without permission and may be removed for any reason at any time. Like beef? Pork? Chicken? Rattlesnake? Mule? Well, I'm no expert. Don't even speak French. Never been there. But I sure liked that car.